The NTxHUG is a community made up of Oracle EPM users, developers, partners, customers, and employees. We are a user group run by users, for users. Our group was founded in Sept 2014 and we are focused on sharing technical and business knowledge about EPM. We are not affiliated with any particular firm, and we encourage Oracle customers, partners, and employees to join us. Our meetings are a place where Hyperion users can network, share, learn, and socialize. The dress code is casual, and all Hyperion related job functions and experience levels are welcome. 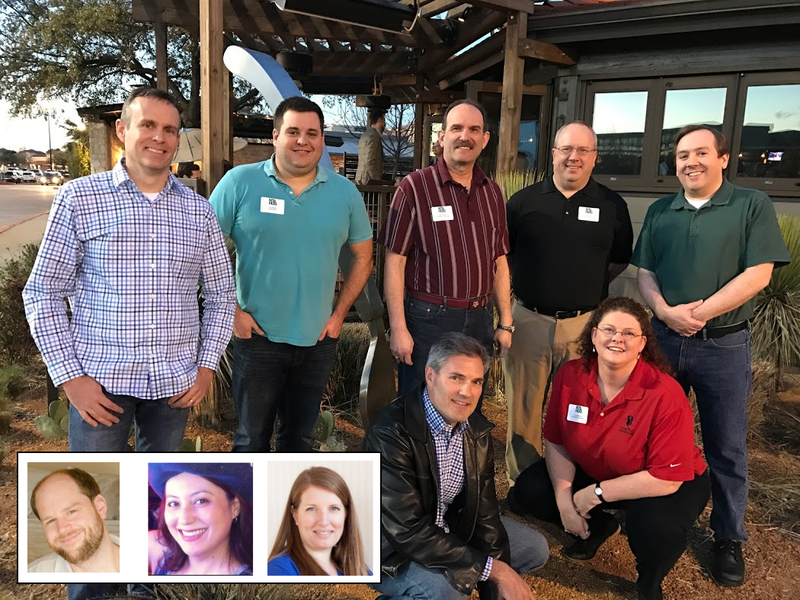 The quarterly NTxHUG meetings are organized by North Texas Hyperion users just like you..
Front row: Brian Marshall, Opal Alapat, Jessica Benbow, John Ceynar, Val Blackburn. ​Back row: Jeff McAhren, Trey Daniel, Henry Robin, Kevin Cox, and Scot Martin. If you are interested in helping us plan meetings, let us know, we'd love to have you. If you would like to host a meeting, sponsor social hour, or present at a meeting, let us know that as well! For more information about our community and meetings visit our LinkedIn group (NTxHUG), and follow us on Twitter (@NTxHUG). You can also reach the core team from our Contact page. NTxHUG Quarterly meetings will take place at customer sites and Oracle sites, meetings will not be held at partner sites. The NTxHUG is free to attendees, and relies on customer and Oracle provided meeting spaces. Email admin@ntxhug.org if you are willing to host a meeting. Presentation length is limited to 20 minutes (30 minutes for Oracle presenters). Presentations may not contain any slides advertising or promoting the presenters company. One presenter biographical slide is encouraged, that includes the presenters name, title, company, contact information, and qualifications / experience. Individuals interested in presenting should send an email to admin@ntxhug.org. Presentation requests are logged and tracked by the NTxHUG, and the organizing committee chooses two or three presentations per quarter at their discretion based on a variety of criteria (submitting does not guarantee the right to present). Selected presenters will be notified approximately 8-10 weeks before the meeting they are to present at. A table will be provided at meetings to display literature for anyone who wishes to do so. Companies are limited to no more than two stacks of literature (max 8.5" x 11"). Sales representatives are welcome and encouraged to participate in NTxHUG meetings, but we request that they do not approach meeting attendees to promote their firms. Conversely, if an attendee approaches a partner or Oracle sales representative to inquire about services or software, sales discussions are allowed. The NTxHUG accepts sponsorships for the social hour portion of the meeting. The NTxHUG organizing committee selects the location for the social hour. Sponsorship is defined as paying for food and/or beverages for the attendees from arrival until 7:00 PM, or later at the sponsor’s discretion. The maximum sponsor spend at the social hour is capped at a maximum of $500, or $20 per person (whichever is higher). In return for sponsoring, the sponsoring firm will be mentioned in the invitation copy (website, email, and LinkedIn). In addition, the sponsoring firm will be mentioned and thanked twice at presentation portion of the meeting (during the agenda review, and at the conclusion of the presentation portion of the meeting). A representative of the sponsoring company must be present at the conclusion of the social hour to pay the establishment. Firms wishing to sponsor NTxHUG meetings should send an email to admin@ntxhug.org indicating their interest to do so. Sponsorship requests will be logged and tracked by the NTxHUG. Sponsorship are granted on a first come, first served basis, and notification will be sent to the next sponsoring company at least one quarter in advance. Companies that have sponsored a social hour must wait one year before sponsoring again (i.e., a firm that sponsored in Q3 2015 may not sponsor again until Q3 2016). This policy is subject to change any time.